A delayed flight has Peyton and I arriving in Akron at 1:00am tonight, but our spirits are not dampened! We're excited to see our Akron friends again, really excited to have a road trip with some of the best friends a guy could hope for, and for having a place in Jacksonville to call "home" and unpack our belongings. We'll get a U-Haul truck tomorrow (Thursday), run a few errands, and get things organized for the load-in. Hopefully by Friday afternoon we're all loaded up and we can hit the road for Jacksonville. We'll drive straight through the night, and arrive at the house we're renting around mid-day on Saturday. Load-out should go fairly quickly (we'll take any help we can get!) and then we can get some much-needed sleep Saturday night. Sunday we'd like to do something fun on the water while Stephanie drives down with the rest of the kids. Dinner together Sunday evening, before Eric, Dave, and Anthony drive back to Ohio (through the night). Stephanie and I will run some errands on Monday (like getting our Florida drivers licenses) before heading back to ATL. 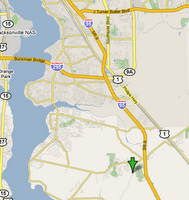 Swing by our new digs (we're at I-95 and 210) and say "Hey" if you're around this weekend. Carry a box, or just cheer and tell us how strong and manly we are!